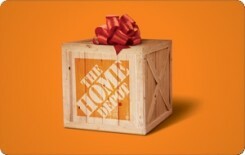 Earn 2 SB per $ when you buy The Home Depot gift cards at MyGiftCardsPlus, powered by Swagbucks. Please allow up to 1 hour upon delivery confirmation for activation before redemption. Swagbucks is not affiliated with The Home Depot®. The Home Depot®; is not a sponsor of this program. The Home Depot®; is a registered trademark of Homer TLC, Inc.